Furniture Available on Seperate Bill of Sale! This beautiful home is located in the quiet cul-de-sac and walking distance from the clubhouse and golf course. The ''SUNFLOWER'' is a split floor plan model with 1650 square feet of pure joy! As you walk up to the house, you'll notice the long driveway provides plenty of extra parking space for your guests. The only home in the cul-de-sac with the charm of a front porch. Great for relaxing during the evenings and enjoying your lush desert landscaping while getting to know your new neighbors. As you enter into the front door, you'll notice the spacious entryway, tall ceilings, and tile flooring throughout. The open kitchen and living room are an entertainers dream! (Click More Info) The eat-in kitchen features and island, granite counter-tops, undermount sink, endless cabinet space, and walk in pantry! It also offers pendant recessed, and under cabinet lighting. The bay window at the kitchen nook is the perfect place to enjoy meals; offering bright natural lighting and a fantastic view into the backyard. The living room offers vaulted ceilings and a gas fireplace to heat those cold Arizona winter nights. It's the perfect place to enjoy with friends and loved ones. The private master bedroom is spacious and also takes advantage of a Arizona sunshine with the large bay window viewing into the backyard. What else can you ask for? Perhaps an inviting master bathroom complete with dual sink vanity, large soaking tub, separate shower, and a walk in closet! Walk into the backyard and notice the exterior is as generous as the interior. 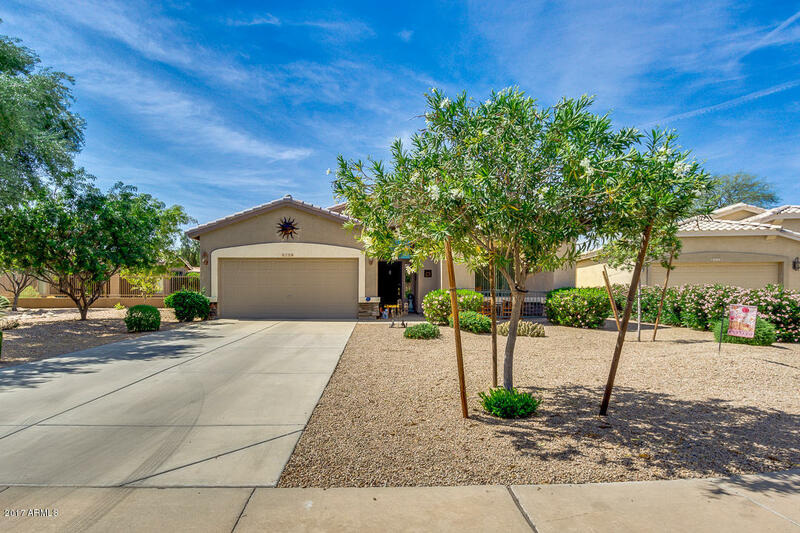 The backyard offers low maintenance desert landscaping with blooming plants, and covered patio. Make your appointment today to view this beautiful home and make an offer today!